They were passionate about answering the question. Sometimes in the conversation about educational policy, we overlook the student perspective. I've provided a sampling of their responses and clarified educational terms within parentheses. Don’t waste as much of our time. I don’t like repetition. We can do things right away. Having GT (gifted and talented) helps because we are with people who think like us. It’s more of a challenge. I wish we could be with people who think like us all day – in the same class. Keep GT. More role playing. I like to role play by putting myself into another’s perspective. Mrs. _________ does this a lot in Social Studies. I got to be the king, and I liked assuming another perspective. More projects like Mrs. ___________’s math investigations. They are real life problems that mean something. Include more units that involve topics we want to learn about. When I learned about Australia, I became an expert on dingoes. These are topics we enjoy, but school doesn’t teach us about them. If it’s not in the curriculum, we don’t get to learn about it, but we love special projects. Instead of more nonfiction, incorporate more fantasy because we’re interested in the genre, and we are capable of making comparisons between the fantasy world and the real world. Assignments should be more interesting - less BCRs (brief constructed responses) and small moments. We should be able to write stories about Super Heroes. Mrs. _________ used two groups (purple, green). She would pre-test and those that thought like us would work on a certain project. If you needed to keep learning a skill, you would do that. It changed throughout the year and kept us interested. More ILA (integrated language arts) discussion groups without the teacher. One student is the leader etc. It is student run. The student discussion group made me really think about what I was reading. The group made me think about the books instead of flying through them. Could we say the BCRs instead of always having to write them. We know how to do them. In math, Mrs. ___________ knows we know the skills, so she doesn’t always make us write all the BCRs. 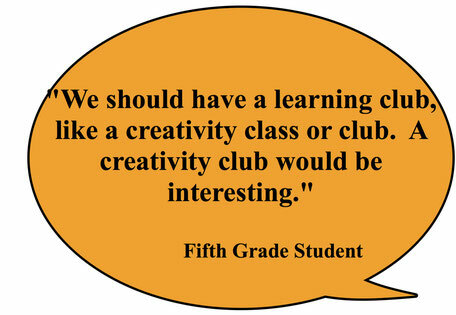 We should have a learning club, like a creativity class or club. A creativity club would be interesting. We could write, draw, play music. An origami club is a good idea too. I wish more classes could be held outside.